What is a Motor Vehicle Third Party (Title/Registration/Motor Carrier/Tax Reporting) Bond in Arizona? A Motor Vehicle Third Party (Title/Registration/Motor Carrier/Tax Reporting) Bond is a type of license bond. The purpose of the bond is to protect the state or governmental entity for certain things, such as the payment of taxes. How Much does a Motor Vehicle Third Party (Title/Registration/Motor Carrier/Tax Reporting) Bond Cost in Arizona? How do I get a Motor Vehicle Third Party (Title/Registration/Motor Carrier/Tax Reporting) Bond? We make it easy to get a Motor Vehicle Third Party (Title/Registration/Motor Carrier/Tax Reporting) Bond in Arizona. Fill out the form above and we’ll get right on this for you. Then we’ll get the Motor Vehicle Third Party (Title/Registration/Motor Carrier/Tax Reporting) Bond right out to you. Easy. It’s highly essential to lots of professional services and construction firms to get license and permit bonds. Most governments require that you’ve got a permit bond for all your processes that include a client. You will need to obtain the bond to obtain the license or permit for your company. The government will use this bond as assurance that the holder obeys all laws and delivers as expected. In this case, any contractor who does not manage to supply the required project result shall face feasible quandaries. If you want to learn more about how to get a permit bond, here are a few of the essential facts that you need to consider. 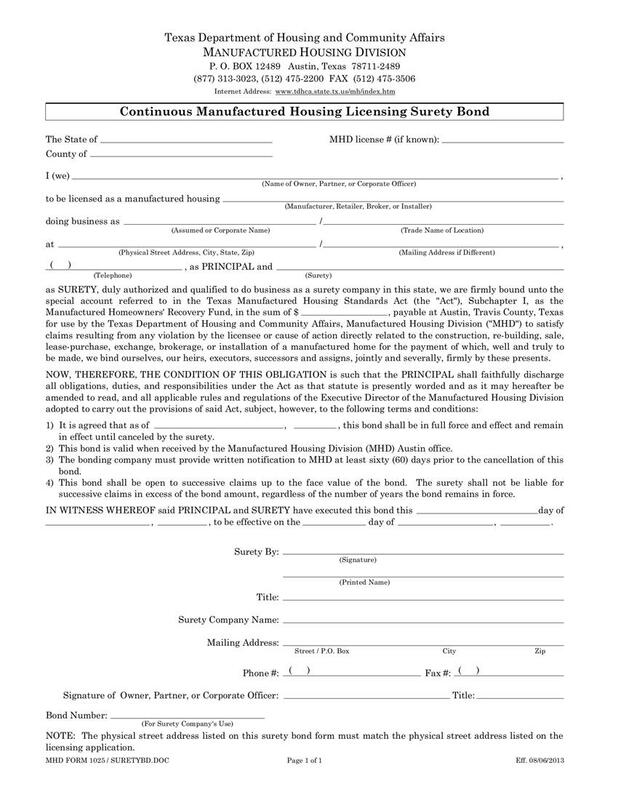 The most common kind of bond is the license and permit surety bond. Bonds are essential factors that many specialists or businesses need to remember before their companies. One of the governing rules that a lot of specialists or organizations need to comply prior to beginning their operation is getting a license. Before beginning your operation, it’s essential to find out first certain requirements of the government related to your company or profession. Consequently, you will need a license and permit bond that helps explain what you should do. In these bonds, you can find all the limitations of your business. Thus, it helps you prevent the possible consequences of breaking these limitations. Using this license and surety bond, you may get your license or permit to run your company in Kansas. There is a number of license and permit bonds that you might acquire, including a contractor license bond. Performance bond is very important in ensuring that you receive a satisfactory project like a building. When you hire a contractor to make a building for you, you’ll need assurance that he or she will offer you the exact results you anticipate. The construction may be successful in a lot of cases due to the indemnity of a performance bond. Nevertheless, should it fail, you’ll get compensation from the insurance company, and another replacement contractor will continue the project. The amount they will get in case the project breaks down is stated in the performance bond. This section details the important advantages that you are going to enjoy once you hire a specialist who holds a license and permit bonds. The government requires that professionals follow a specific system while doing their things. For a construction project, as an example, license bonds define the step-by-step procedures of the different processed to be done. When you hire a contractor, he or she has to follow this system. Permit bonds serve as an insurance to customers who involved specialized help. It indicates that the client can be reimbursed for a particular portion of the project should it fail. If a specialist fails to provide what he or she promises, you have to sue his or her bond and you’ll get settlement totaling to the bond’s specifications. Following the right procedures in acquiring license and permit bond is the easiest way to obtain it. Here is a list of approved methods that you will need to follow when looking for you license and permit bonds. Filling out the application form is the first step that you have to do. You could find this online application form through an authorized issuing company that is highly recommended by many users. Before you submit the online application, be sure that you have checked the data first so that you’ve got verified its correctness and completeness. Be honest when filling out the form for it could result in serious predicament if you do not. Next step after submitting the application is the quote, which indicates the amount you have to pay. You will make payments depending on the quote you receive as response. Take note. It’s only following the application form has been successfully submitted that you’ll be able to acquire a quote. You must then pay money for the license and permit bond. You can only obtain a license and permit bond after you have paid the issuing company. Don’t attempt to fabricate the info you will provide to the bond. It is because doing so will simply result in difficulties, like legal action. Keep in mind that surety bond is governed by laws and regulations. Also, you will need to offer financial info connected to the bond, which makes it impossible for you to fake it. In addition to the different types of surety bonds, and its advantages, there are other important facts you have to learn about license and permit bonds. For example, permit and license bonds are worth a specific amount of cash. For example, the government might require that you purchase a license and permit bond worth $500,000. Consequently, the amount you are going to find in the bond is not the same with the project cost. Instead, the payment you make will only be equal to 1% of the entire bond’s worth. Your bond will protect your customers from any misbehavior or disability to carry out. If you’re a contractor, you need to consequently abide by this governmental requirement in order to avoid legal cases with your consumers. You have to be careful not to get bonds from unverified government bodies. You might resort to specialist help when you’ll need additional info on which kind of bond is appropriate to your company operation. See our Arizona Motor Vehicle Third Party (Towing) Bond page here.